The LT9000 is a continous level transmitter that detects the level of an electrically conductive liquid in a tank or other vessel. The LT9000 can also sense the level of an interface such as oil/water. 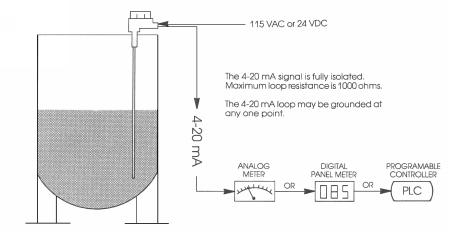 The isolated 4-20 mA output signal can drive a load of up to 1000 ohms. Zero and span can be set over the entire length of the probe or any portion of the probe. Hazardous Area: Class I, Group D. Class II, Group E,F,G. Electronics: Housed in cast aluminum explosion-proof enclosure.